My life has been quite... crazy lately. Let's just say that I am not having the relaxing summer that I thought I was going to have... Actually, I can't remember when I've ever had a relaxing summer. Summer means work! However, it's not all work. I have had the opportunity to spend time with some of my family and my closest friends. 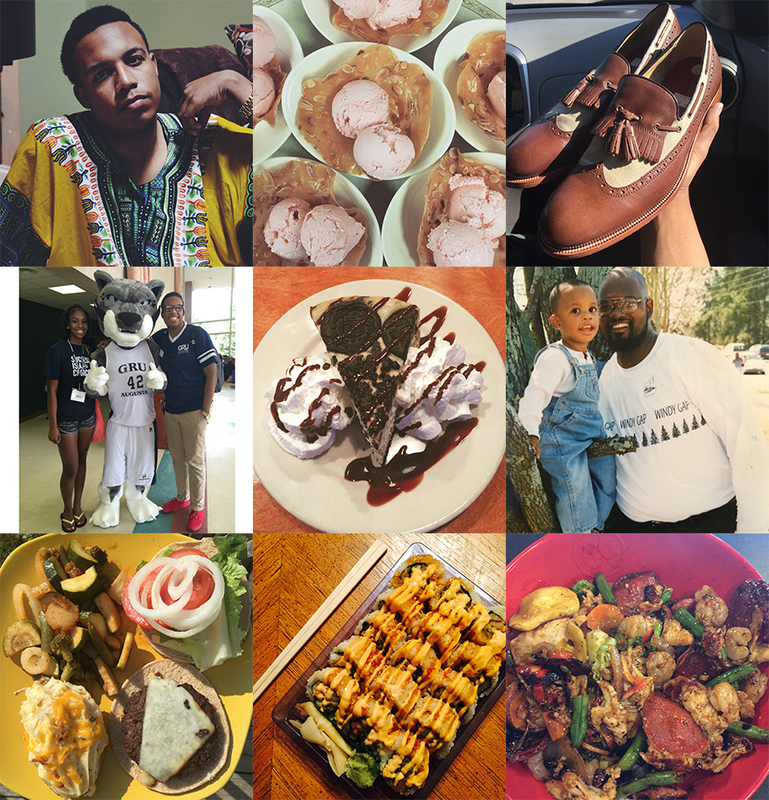 As you can see by my collage below, I have ventured into becoming quite the foodie! I know another amazing foodie, who you'll get to meet sometime later in the summer. For the time being, let's delve a little into my life, shall we? I Chose... A Journey: Besides spending most of my time on The Mod Prep, I actually do have a rather exciting life outside of it. I still have a job at The Augusta Country Club, and I'm still a Lead Orientation Leader at Georgia Regents Unviersity. This year's Orientation is much more interactive, with components of Social Media, as well as a theme which is "I Chose A Journey", I'd like to feel responsible for that happening! GRU has a big "I Chose" Campaign trying to recruit students to the school, and I felt that orientation is the start to the college journey! The way our Orientation schedule works is that we have 3 two-day orientations in June, 2 two-days and a one-day in July, and a one-day in August. It sounds like a lot, I know, however, we have been training since January to be able to perform and be successful as Orientation Leaders, and I think we have done an amazing job so far. I am paired with Jessica in Group Safari, and our group is always the best. I think it's so funny how I would be put in Safari, since animal prints have a huge spot in my heart, more specifically leopard. I have gotten to meet some pretty amazing students during our June orientations. One student said to me, 'You're the most outgoing and charismatic person I've ever met', I don't want to sound sappy, but that meant so much to me because it showed me that I truly have an impact on the student's decision to attend our university. We get to have two weeks off (this week + next week) for vacations, and then we hit the ground running with orientations in July. While it is very tiring, being an Orientation Leader and now a Lead Orientation Leader has been one of the best experiences of my college career and young adult life. Collaborations G A L O R E: I bet you've been wondering why I've been featuring so many people/businesses/products on The Mod prep. Well you little curious mind, I have been using my powerful networking skills to showcase talents in the fashion industry, which will grow my audience. Nothing deeper than that. I realize that it can't just be me all the time, if I give others opporuntities to be on The Mod Prep, then I instantly have a greater following, because of the power of networking. I have some really cool collabortions coming up, so continue to stay on the lookout for those. I am always in the mood to collaborate with others, so if you or someone you know is interested, please don't hesistate to email me @ rickey@themodprep.com. I would love to work with you! Powered by Cincopa &amp;amp;amp;amp;lt;a href='http://www.cincopa.com/video-hosting'&amp;amp;amp;amp;gt;Video Hosting for Business&amp;amp;amp;amp;lt;/a&amp;amp;amp;amp;gt; solution. Getting Back to the Old Me... Financially: When I first started this blog, it wasn't all about fashion, but predominately about finances. I went back to read some of my old blog posts, and I want to repost them as financial reminders for myself, and hopefully they will reach out to more people this time. I know they will help me! I told you my summer's been kind of crazy! However, I am definitely trying to stay on top of it! Here's to rest of my summer, and all of the adventures it will bring! P.S. Happy Belated Birthday to my fabulous cousin Jamie who is turning 13. Her sass, style and strut are something that every young teenager should embody! I love you Jamie!